Hadash Knesset member (MK) Aida Touma-Sliman (Joint List) is currently conducting a speaking tour in the United States, sponsored by the US Peace Council. 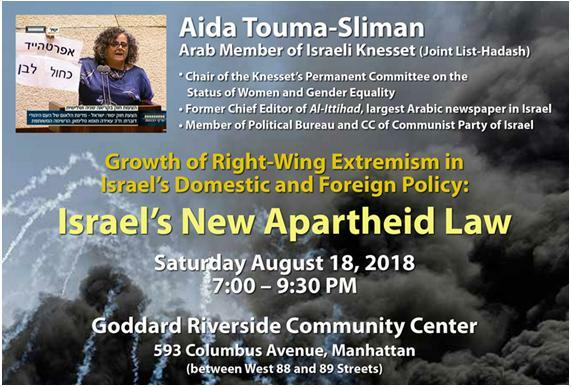 The communist MK’s first talk on the “Israel’s New Apartheid Law” will take place tomorrow, Saturday, August 18, in New York City at 7:00 pm, at the Goddard Riverside Community Center, 593 Columbus Avenue in Manhattan. On Sunday, August 19, MK Touma-Sliman will speak at the Palestine Museum in New Haven, Connecticut at 2 pm (1764 Litchfield Turnpike, Route 69 Woodbridge). During her talks, Touma-Sliman will focus on the most recent manifestation of Israeli apartheid: the Basic Law “Nation-State” passed by the Israeli Knesset last month. Touma-Sliman is the first Arab and woman to head the Knesset’s Committee for the Advancement of the Status of Women. She recently convened a hearing on the impact of Israel’s blockade of Gaza on the women who live there and was verbally attacked and threatened by her Zionist colleagues for doing so. Member of the Political Bureau of the Communist Party of Israel, Touma-Sliman, a prominent feminist activist, is the founder of the Women against Violence Association, and is former editor of the Arabic-language daily newspaper Al-Ittihad. She is not only the first and only woman in Israel to have headed up an Arabic daily newspaper, but is also the first woman elected to the Higher Monitoring Committee for the Arab Citizens in Israel. In 2007, Touma-Sliman was among the women candidates to be nominated for the Nobel Peace Prize.